Earlier in the week a friend on Facebook linked to a great blog post on a blog I’d never read before. The post is called The Keys to Success in Magic. It makes a great point, that most witches/magicians/sorcerers worth their salt don’t do magic most of the time. I’d say that’s true! Midway through the post the author has a ‘flow chart’ of his practice. If I had to make a chart, this would be pretty close. If we’re not making magic, what do we do? I can’t speak for most other people, but clearly this gentleman and myself – and many of my magical and/or Pagan friends – are similar in our approaches. Let’s walk through this flow chart together. The foundation of all practice is some form of meditative practice. I learned mine primarily from yoga, but it was in my training with T Thorn Coyle where I was pushed to incorporate meditation into a daily practice. Before I had kids I would do 20-30 minutes of sitting practice every morning. I sat, checked in with all my parts – my body, my emotions, and various souls – and breathed through whatever came up. It was during this time that I finally got a handle on my anxiety issues, all through a daily sitting practice. Now that I have kids, my practice isn’t so extensive or regular, but there is some form of breathing exercise every day. If I had to wager a guess, I’d say I sit before my altar three to four days out of 7 in the week, but there is some form of conscious breathing moment every day. It truly is the foundation of all else. Why is breathing so important? In my experience it is useful in several ways. It teaches us to connect with all of our parts. I am learning to listen. What is going on with myself, physically, emotionally, mentally, spiritually? I am getting better at listening to others, both human and non-human. I am learning that my thoughts might not be the truth of the matter, nor might they be the most important information in any given moment. Mostly what happens when I sit in meditation is that my brain hits me with every task I need to keep track of: grocery lists, appointments, blog post ideas, etc. My ears strain to hear the kids in the other rooms. What I do is I thank my brain for taking care of all that information and I let it go, just focusing on the breath. One of these days I’ll get back to the deeper levels of meditation. It happened before, so I know it can happen again. But this tool, this ability to slow down and quiet the mind is invaluable. Being able to step outside my reactive thought processing and learn to listen with other parts of myself has been the key to my mental and spiritual health. 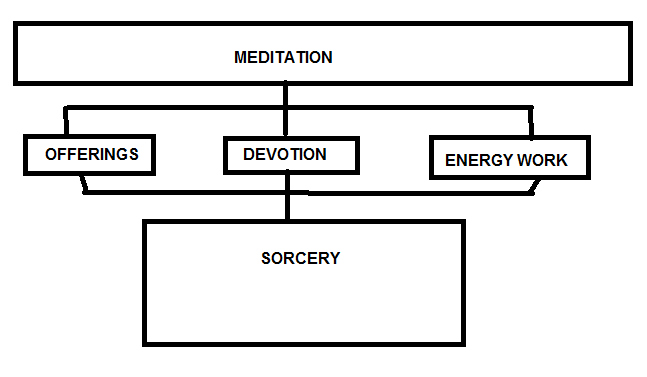 The creator of the above flow chart has listed devotions, offerings and energy work next. Again, I think these three things are the next most important acts, after meditation and before magical work. Devotions and offerings are perhaps one and the same in my mind and practice. Every dark moon I replace the offerings of water. sometimes I offer special incenses. Sometimes I buy flowers for a certain god. Every Tuesday I do Kali puja. It was not until I delved into a three-month Hindu practice, back at the beginning of this blog, that I learned how important and powerful devotions could be. Elaborate or simple, they are a way to build connection with deities and spirits. I learn something new each time I do it. Occasionally I do something a puja for Shiva on Monday, sometimes something formal for the Red Goddess on Friday. But always, every Tuesday for Kali. sometimes these rituals yield immediate results, and by that I mean, felt connection or certain blessings later in the day. Some days there’s no felt connection. Never do I feel it was a waste of my time. Lastly, I would call the lessons I am doing for my Feri training my energy work. Right now we are working through the Iron Pentacle, a form of energy and value system, that is unique to the Feri tradition. Making kala, a form of purification, also falls into energy work. I make kala at least once a week, sometimes more as needed. Lastly comes making magic. I include reading the tarot in this category, as well as spells or ritual. I don’t often read for myself. If I read it is usually for others. I go in phases, sometimes pulling a card every day, sometimes doing a reading on each full moon. For the last year I’ve been rather inactive with my cards. When I do make magic, use spell work, or construct a larger ritual, there is always a specific need. I spend several days giving the purpose much thought, and once the intent and/or goal is clear, I figure out what course of action is most appropriate. I want to make sure the timing is right, that I have the items needed for whatever working I’m doing, and that I’ll have uninterrupted time and space to complete the working. My experience is that, while I don’t make magic often, when I do, it is effective. I don’t think I’m any more innately gifted, psychic, or touched by the gods than anyone else. What I am is deliberate. I think the scaffolding of my practice also sets me up for success. Before magic comes gaining strength in skills and forging relationship with others, gods and spirit allies and the world around me. But before even that comes getting centered within myself and letting go of the chatter in my mind as much as possible. If I could sum up in a less wordy way an answer to the question ‘if not magic, what do you do?’ the answer is basically: I breathe. This entry was posted in Uncategorized and tagged Feri, Hinduism, Kali, magic, pagan, Shiva, tarot, the Gods, witchcraft. Bookmark the permalink.